With just over 50 days until Invercargill’s Stadium Southland Velodrome plays host to the 2012 UCI Juniors Track World Championships, organizers are dusting off the SOLD-OUT signs. The Junior World Track Championships in Invercargill are on their way to a sell-out with nearly two-thirds of the tickets already gone. Event Director Sue Clarke says the response from the cycling and local community has been outstanding. Tickets are selling well across all sessions with Saturday’s night session and the final session on Sunday afternoon particularly popular. “Traditionally, a lot of us leave our decisions late as to whether we turn up to events. It looks as though if you do that for the Junior Worlds, you might be disappointed,” Ms Clarke said. 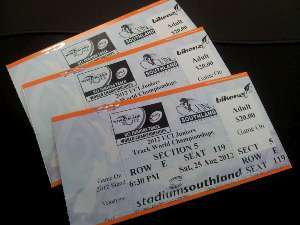 Tickets are on sale through Stadium Southland’s Booking Office, by phone on 03 217 1200 or online at www.juniorworlds2012.com. Event passes to all nine sessions are available for just $130 for adults and $80 for students/children with individual session tickets starting as low as $10 for adults and $7.50 for students. A build up event to the World Championships featuring the full New Zealand Junior Squad is also to be held on Saturday 11 August.